GameBros Dev’s Idle Shop Empire is an amazing Idle game for mobile in which the player manages malls and make money by selling a variety of products. As per the current version of the game, In Idle Shop Empire game, you can manage up to three malls. You get the first mall for free and start the money making process by selling french fries. As you build more floors, sell more items, your profit will increase. And you will be able to unlock a new mall. In each mall, you can build up to 20 floors. And on each floor, you sell a unique product. The concept of this game is quite simple and easy to understand. If you have not played this type of game earlier and looking for a guide or some tips, cheats & stratgey, then we are here to help you. In today’s post, we have covered everything about the game you need to know: Idle Shop Empire guide and Idle Shop Empire tips, cheats & strategy. Before we head to the tips, cheats & strategy part, let’s learn the basics first. In Idle Shop Empire game, your main objective is to become rich. And to accomplish this objective, you have to discover all the products by building all the floors in each mall. First of all, let’s learn how its mechanics work. In the mall, you supply the products to each floor through the elevator. And you get the product supply every few seconds. The courier boy, after getting the supply from the bus, visits each floor and fills up the stock. For example; you have space for seven BITCOINS(In-game product), then it will fill all the free slots. On each floor, you can stock a certain number of items. If you want to store more(to complete the orders fast, without making the customers angry), then you will have to increase the stock size. All you need to do is tap the stock slots and increase its level. Customers take time in checking out. You can reduce this time and speed-up the process by increasing the floor level. The courier boy takes time in supplying the products on each floor. By increasing the level of the elevator, you can reduce the time. By increasing the product level, you can increase its price. And after reaching a certain level(50, 100, and so on), the price of the product will increase by a huge amount. So if you want to make more money from existing products, make sure to level up the product. Mega Coin is the premium in-game currency in Idle Shop Empire game. You can use this currency to build the floors or in activating the boosters. On the main screen, at the bottom, tap the mega-booster option -> there you can buy speed boosters, cash boosters. As per the current version of the game, two-speed boosters are; triple speed, 4X speed. These boosters will increase all the things; product supply, customer’s check-out speed, and more. The cash boosters are; Sign Spinner: It increases the income by +25% for five minutes. 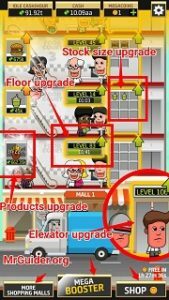 Elevator Booster – Probably the best booster in Idle Shop Empire game: It will increase the product supply speed to each floor for two minutes. Cash Joker: It increases the income you generate from customers by 10 times. Read the tips, cheats & strategy part below to learn all the ways of obtaining Mega Coins in Idle Shop Empire game. On the main screen, at the bottom-left corner, tap the shopping malls option and head to malls screen. The second mall unlocks when the player builds eight floors in the first mall. And the 3rd mall gets unlocked when the player builds eight floors in the second mall. The cash you earned from the mall cannot be used in other malls. There is a separate account for each mall. So that’s the basic Idle Shop Empire guide for the beginners. Now, read our top Idle Shop Empire cheats, tips & strategy guide. From different products, you make the different profit. 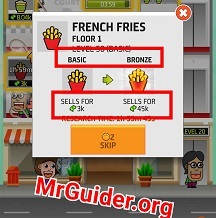 For example; There is a huge difference between the profit you earn from french fries floor and the diamond floor. The higher the floor rank is the more money you make from that product. For example; at floor number 5, you sell headphones. And at floor 9, you sell wristwatch. You make more money from the wristwatch as its price is high. So if you really want to progress fast, then focus on high-rank floors and increase the stock size. And level up that product too. On the other hand, if you focus only on low-rank floors such as french fries, lemonade, hamburger, then you progress rate will be slow. So we would recommend you to focus on the money making product rather than spending the whole money on low-rank products. Additionally, it would be better to save money and build new floors as soon as possible. As mentioned above, by increasing the product’s level, the player can increase its selling price to earn more money. And when you reach these levels; 50, 100, 200, and so on, the quality of that product will increase and the price of the product will also be increased by a massive margin. So make sure to upgrade the best money making product. Mega Coins can be used in activating the mega boosters. You can claim 2 mega coins every 4 hours. On the main screen, at the bottom-right corner, tap the shop option and just below the free coins section, you can claim the offer. By watching the video ad, you can obtain free mega coins and activate the income multiplier boosters. For free mega coins, go to the shop tab -> just above the coins pack section, there would be an offer; watch a video ad for mega coin. You can easily earn free mega coins by watching multiple video ads. For free booster, on the main screen, at the bottom, tap the mega-booster option -> under the speed booster, the first offer would be double speed. It can increase the game’s speed for five minutes. In short, you will earn 2X income for five minutes. You can use mega coins in buying the floors or activating the mega-booster. However, the floor’s cost is too high. You can either save it for later or activate the boosters; Elevator Madness and Cash Joker are good boosters. Previous Post:Survival Heroes: Best Weapon In The Game?